You can search for all Valencia homes easily and quickly. Just click "Search" in the box above. Automatically receive updates of every new Valencia listing or price change as it becomes available. Never miss a listing again! 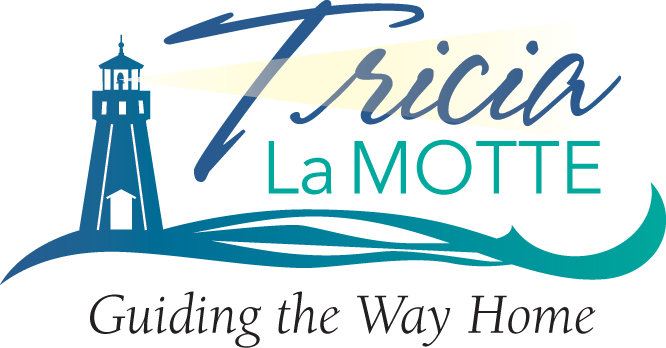 Looking for an established beautiful master planned community? You'll find that Valencia, a community within the Santa Clarita Valley is sought after by home buyers looking for a well-maintained community with excellent schools. Valencia, California is listed in the book "Lee & Saralee Rosenberg's 50 Fabulous Places to Raise Your Family". The master-planned community of Valencia, surrounded by several mountain ranges, was established in the mid-1960s by Newhall Land and Farming Company. It is convenient to the Westfield Valencia Town Center Mall, numerous restaurants, shops, and theaters. You'll find College of the Canyons, Cal Arts Institute, parks, walking trails, and easy access to Interstate 5 freeway for commuters, and a wide choice of homes are reasons you'll want to consider Valencia! It has grown toward the north to include the various Valencia neighborhoods of Valencia Northbridge including Valencia Northpointe, Valencia Northpark, all of which are located north of Newhall Ranch Road and extend a bit past Copperhill Drive to the north. The Valencia West Creek homes and West Hills homes have more recently been built north and south of Copperhill Drive, and offer views of the Santa Clarita Valley toward the south. Valencia Creekside, Promontory and Alta Vista which are located in the Valencia Copperhill area are located to the west of McBean Parkway. These villages offer their own unique styles and are well located to shopping and restaurants, with walking paths. You'll love the beautiful tree-lined streets, greenbelt areas and paseos which beckon a walk through the neighborhood. Great schools, parks, nearby shopping, restaurants, and the Westfield Valencia Town Center Mall further enhance the area. The homes of Valencia Summit feature a variety of architectural styles such as the Valencia San Marino neighborhood - Mediterranean homes with white stucco and red tile roofs, covered porches and tile detail. Then there are the executive homes of Windemere, with an English flavor with front gated patios, and spacious one story and two story homes. Or perhaps French is more what you are seeking - the feel of being in your own private chateau. Well, you can find that also in the Chelsea Homes at the Summit! So many homes built in the late 1980s, that are located in these beautiful areas of Valencia, have been remodeled with updated kitchens and bathrooms. These are a delight to behold since they combine unique and sought after floor plans with an updated look. Enjoy living in the Summit because of the proximity to the Summit Park. This is a natural arroyo with walking trails that wind through the acreage. Many of the homes, including the gated community of the Stratford Collection, offer spectacular views. There are a number of gated neighborhoods in Valencia. They include condos, townhomes, cluster homes, and large single-family homes. The guard gated neighborhood of Valencia Woodlands, built by Taylor Woodrow is located near College of the Canyons and offers view homes and easy access to the Interstate 5 freeway. You'll find lovely cluster style homes with a Santa Barbara feel and large executive golf course view homes with Spanish styling overlooking the Valencia Country Club on oak studded lots. Valencia Westridge has several gated home tracts. They include townhomes with golf course views, large single-family homes, and custom estates. 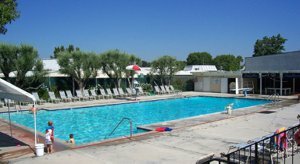 The active 55+ resident will find that the guard gated neighborhood of Belcaro has lots to offer. Looking for a gated condominium or townhome in Valencia? 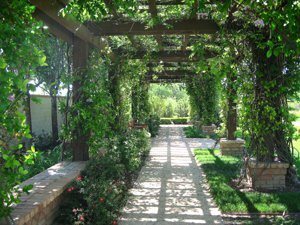 Then consider Arbor Park, Las Ventanas, Arroyo West. Avignon has views of the Valencia Country Club golf course. West Hills is another gated neighborhood with many styles of homes. 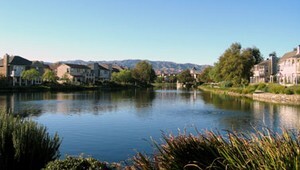 And you will find the lake view gated homes at The Island and the Colony in Bridgeport. Valencia Bridgeport is a one of a kind village built around a lake, with a number of different home styles including townhomes, and luxury homes built on the lake's edge. Bridgeport offers the gated community of The Island, which are luxury homes that front the beautiful lake. Last but not least...and actually, built first is the area of Valencia south of Valencia Blvd., known by Realtors as “Valencia One”, or "Prime Valencia". Valencia One is where Valencia began with the first families moving into the Old Orchard Homes in 1967. 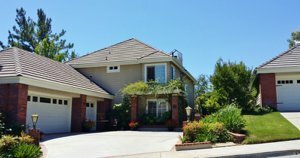 It is still a sought after neighborhood, with its well laid out floor plans, beautifully landscaped paseos (walking trails), mature trees, and close proximity to the Interstate 5 freeway. Valencia real estate offers many choices: starter homes for the first time home buyer to the move-up home buyer and the Valencia luxury home buyer. Choices include condos and townhomes many with their own yards, in beautifully landscaped developments to single family homes in desirable community clubhouse neighborhoods, and custom estate homes with golf course views. And active adults (once know as mature adults or seniors) have many choices of beautiful well-planned homes in Belcaro. 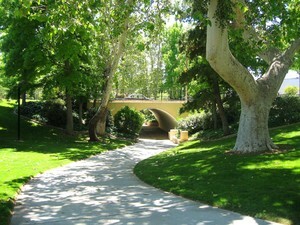 Valencia neighborhoods offer over 24 community parks. You'll find amenities such as neighborhood clubhouses, community pools, play and sports areas, beautifully landscaped walking and bike paths. The paseo system is over 30 miles of landscaped pathways and trails which connect the various Valencia neighborhoods. Valencia is home to the first Tournament Players Club golf course in California. Golfers also enjoy the Valencia Country Club golf course, and the public golf course Vista Valencia.